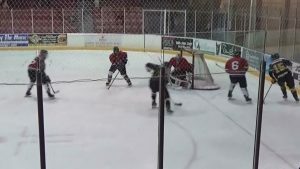 The Bruins travelled to Campbellford Saturday to take on the last place Rebels in the Tod Divison. Uxbridge outshot Campbellford 49-15 and came out on top 5-1. Jake Gordon got the win between the Bruins pipes. Uxbridge returns to the Bear Den on January 4th for their next game against the Georgina Ice. Photo: Finn Reeves celebrates first Bruins goal. 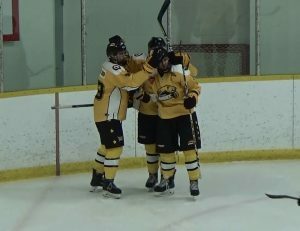 Uxbridge Bruins hosted the Port Perry Mojacks on Friday evening in a commanding win. 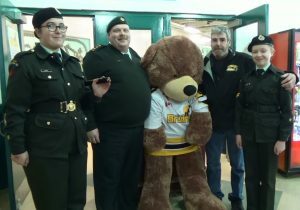 The Bruins hosted the Little Britain Merchants on Friday evening at the Bear Den. Despite leading for the majority of the game, Merchants would tie it and net the go ahead goal within seconds of each other with only 1:04 remaining in the 3rd period. Highlights of Bruins goals. Videographer Peter Ovens. 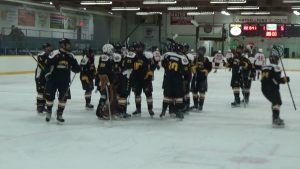 The Uxbridge Bruins travelled to Clarington on Thursday evening to face the Eagles. Bruins chipped away and by the end of the end of 2 periods it was 5-0. Ryan McConkey stood tall stopping 23 of 24 shots. The Bruins would finish 5-1. Comments Off on Attention: Tonight’s Home Game in Uxbridge Dec.14/18 Postponed! 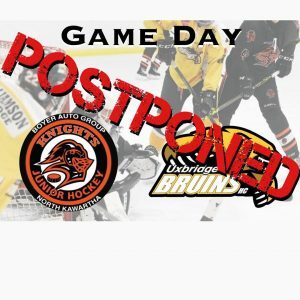 Attention: Tonight’s Home Game in Uxbridge Dec.14/18 Postponed! Tonight’s Bruins Home Game Dec.14/18 between the Uxbridge Bruins and the North Kawartha Knights has been POSTPONED due to deteriorating weather conditions in the North Kawartha area and will be rescheduled at a later date. Comments Off on Bruins win 7-2 over Mojacks! Bruins win 7-2 over Mojacks! After trailing 2-0 in the first period on Sunday afternoon in Port Perry, the Bruins got rolling with a Justin Bennett goal down by 2-1 after one period of play. In the second Stefan Palatsidis scored a natural hat-trick. The last goal came after 5 minutes and 18 seconds from his first. A beauty deak to back hand through the legs as Cameron Moffitt got the fifth. Simon Feig (PP) against his former team, and a shorty from Daniel Giorgio sealed a 7-2 win over Port Perry. Ryan McConkey with the win in goal for the Bruins to improve to 10 wins and 6 losses on the season. Sorry but no Video Highlights available for this game. Up next is this Friday North Kawartha as the Bruins are in a 3 way battle with them and Lakefield for 1st place. The Bruins battled back to force overtime at the Bear Den on Friday night. The team would like to thank our fantastic fans for their donations at Teddy Bear Toss Night in support of the Uxbridge Community Toy Drive. The crowd on hand was treated to an outstanding back-and-forth game. Cameron Moffitt scored just with just over 3 minutes to play in the 3rd period, as Uxbridge stormed back in a see-saw affair between the rivals. After an overtime period filled with sensational scoring chances, the Bruins ultimately earned a single point after seven minutes of extra time. 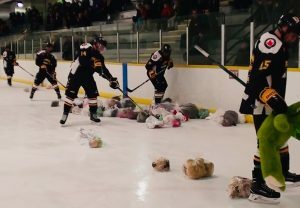 Newly reacquired forward Simon Feig sent nearly 100 stuffed animals flying onto the ice when he opened the scoring with a powerplay goal, 11 minutes into the action. The Bruins held a 2-1 lead at the end of the 2st period after a Daniel Giorgio score. Travis Buxcey tied the game 3-3 after a pair of Clarington goals early in the 3rd period. Highlights captured by team videographer Aiden Berghout. 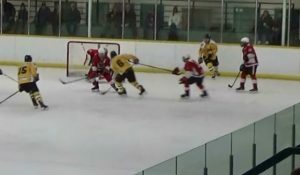 Please subscribe to the Bruins official YouTube channel for exclusive PJHL highlights. 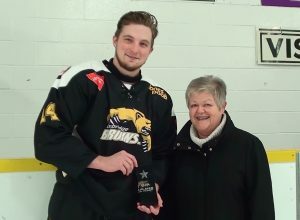 Jackson Savery was also presented his Pepsi offensive player of the month award for November for the Orr Division. Presenting the award was Orr Division Convenyer Liz Basinger. The Bruins took the first of two meetings with the Tod division Campbellford Rebels in the Eastern conference interlock schedule. Ryan McConkey got the shutout in the 13-0 win. 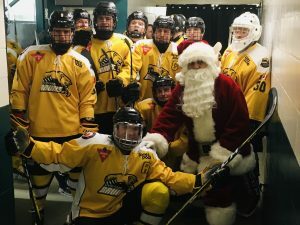 The Uxbridge Bruins are back in action on Friday, Dec. 7, at the Bear Den against the Clarington Eagles. 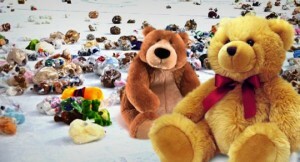 The game will be our annual Teddy Bear Toss night in support of the Uxbridge Community Toy Drive.